Make the City of Glens Falls NY your Favorite Vacation Spot! The City of Glens Falls NY is a fabulous Upstate New York vacation destination! Known as the southern "Gateway to the Adirondacks", it is centrally located on the "Big Bend" area of the Hudson River just north of Saratoga Springs. Known as "Hometown USA", Glens Falls has twice been selected as the nation's "most typical" small city. Visitors will find a diverse selection of lodging that includes a historic hotels and motels, bed and breakfasts. The attractive main street is lined with historic turn-of-the-century architecture with small shops, restaurants and delis, antique stores and a dinner theatre. The city park has a gazebo where musicians and artists can often be found during the warm summer months. Among its many charms, Glens Falls boasts an unusually long list of cultural attractions for a city of its size, including The Chapman Museum, home of original works by old-world masters, the thriving Charles R. Wood Theatre, and the Glens Falls Civic Center, a venue that supports concerts, sports events, and trade shows. The Lower Adirondack Regional Arts Council holds a craft festival each summer that draws thousands. 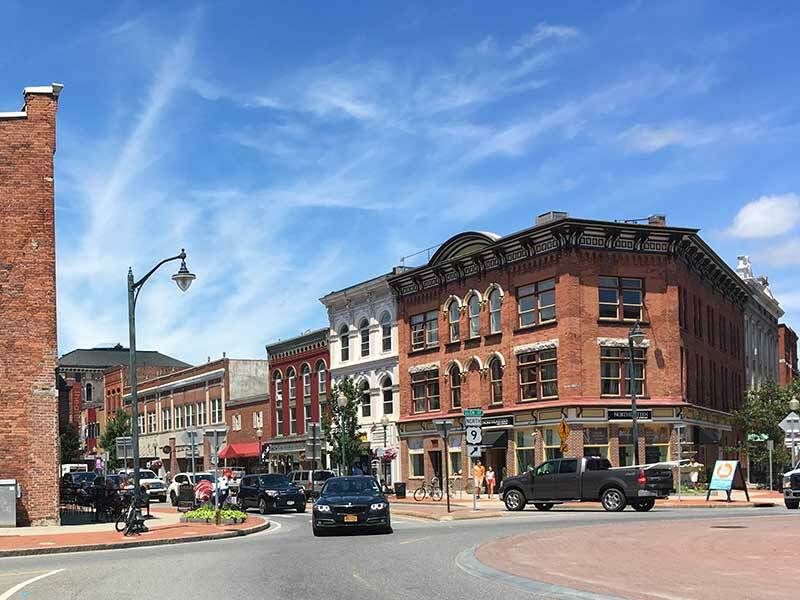 The Adirondack Hot Air Balloon Festival, the Adirondack Theatre Festival, and the Glens Falls Symphony all add to the amazing appeal of this small-town city. Glens Falls is prominently noted in James Fenimore Cooper's novel, "The Last of the Mohicans". Today there is a viewing platform and information about the author and the Mohican tribe under the famed "Cooper's Cave" Bridge. Glens Falls is centrally located, just off exits 18-20 of the Adirondack Northway Interstate 87. The city is just 15 minutes from Lake George Village, one hour from Albany, and less than a half hour from Saratoga Springs. The City of Montreal is just a 3 hour drive north.